For me one of the joys of Thanksgiving is trying new recipes. I found this easy to make chutney recipe in a book called "The Forgotten Art of Making Old-Fashioned Pickles, Relishes, Chutneys...." by Yankee Books. This is a perfect Thanksgiving side dish. Pare, core and chop the sour apples. Put into a kettle and add the remaining ingredients. Stir together and simmer the mixture until thick. 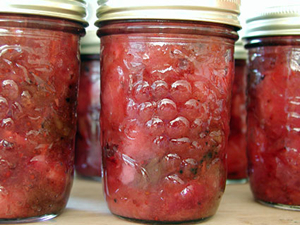 Pack in sterilized jars and process. Makes about 4 pints.